The preschool music program is a fun, group music class for children ages 4-6, designed to teach the basic fundamentals of music. All classes are limited to 6 students per class and are 45 minutes once per week. 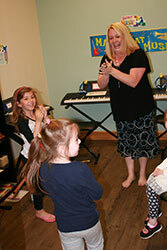 The rhythm component is taught by doing fun games with rhythm sticks, triangles, shakers, hand drums, etc. For the melody component they learn the concepts through lots of singing. They will learn high – low, loud – soft, pitch, major – minor, etc. The preschool music classes are taught by our instructors with specialized training in music who love working with young children. The instructors are patient, fun and very encouraging. 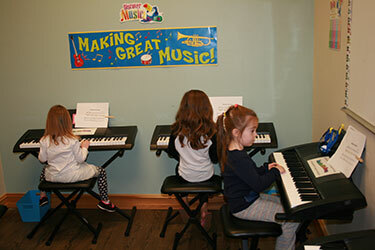 The preschool music program prepares students to go on into private instrument lessons when they are older.